Revenue losses and fraud may be higher on the agenda for communication service providers (CSPs) following independent research released by Neural Technologies. A new global survey of 113 CSPs has found that these losses have now reached 13.1% of gross revenues. Let’s take a moment to consider that, says Jeremy Cowan. For every $100 earned by telecom network operators and or service providers, $13.10 will fail to reach the bottom line either through fraud or failed systems and processes. The survey team talked to service providers in eight regions; Africa, Middle East, Western Europe, Central Asia (India, Pakistan, Afghanistan), Southeast Asia, Eastern Europe, North America, and Caribbean & Latin America. Inevitably, there are significant regional variations – Central Asia reports the highest level of revenue loss at 17.0% and Western Europe the lowest at 8.2% – but the findings are in line with similar research carried out over the last decade and more, including by the US-based Communications Fraud Control Association (CFCA). Other surveys using a similar methodology to that of Neural Technologies (and their research partners, Milner Strategic Marketing) have shown global losses among communication service providers (CSPs) ranging from 10.5% (2004) to 13.6% (2007). So there are good reasons to believe that these figures are accurate. What are the greatest threats to revenue? As in previous studies, the greatest source of revenue losses globally lies in poor processes and procedures, although there are variations by region (see slide above). Other significant factors include failures in credit management, external fraud, fraud by other service providers, rating and charging errors, poor systems integration and internal fraud. Mistakes and failures may outnumber calculated fraud, but service providers cannot be complacent. Only concerted efforts by well-drilled teams (either internal or external) are likely to curb these losses, say service providers. Internet of Things – opportunity or revenue threat? Looking at the Internet of Things in particular, the survey asked if IoT was perceived as an opportunity or threat to revenues. The slide below shows that globally 74% of respondents see IoT as an opportunity to improve their company’s Average Revenue Per User (ARPU). Only 10% see it more as a risk, and the balance (16%) believe it will not affect their ARPU. As the slide below also shows, there is considerable regional variation over whether the improvement in ARPU will come about through their own services or those of application partners. Almost six in ten (59%) of Western Europeans are confident that their own services will bring the improvement, compared to just 28% in CALA. 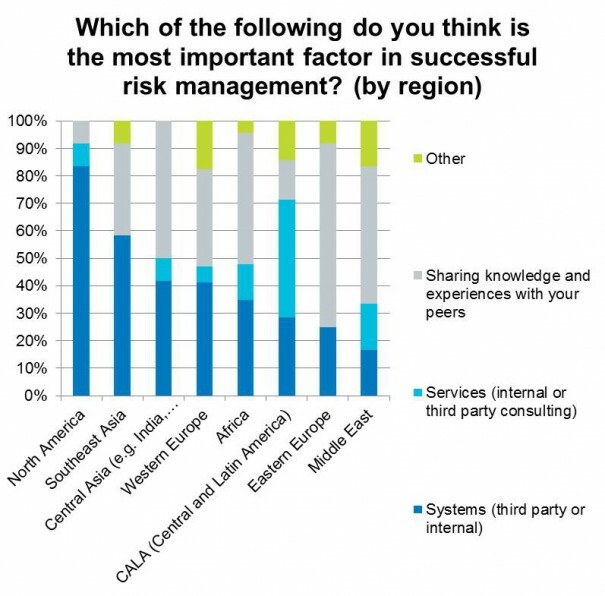 The Neural Technologies survey also asked ‘Which of the following is the most important factor in successful risk management?’ According to the respondents, key factors in successfully combating revenue losses include sharing knowledge (cited by 41% of respondents globally), and almost as important optimal revenue management systems (40%), while 11% say improved services (either internal or from third party consultants), and 9% say ‘Other factors’ are most important. Even here, there is huge variance. In all, 83% of North Americans suggest that enhanced fraud management systems are most important, while only 17% of those in the Middle East agreed. No respondents in SE Asia described Improved Services as the most important factor, yet it was the key objective for 43% in CALA. Of course, fraud-related revenue losses have always been a key factor for CSPs, and the survey is a reminder that there are companies like Neural whose focus on these issues has not wavered. Telcos should welcome the report as there has been a dearth of independent global survey data for a while – CFCA provides some valuable information, but its membership is more North America-focused and the data correspondingly narrower. In part 2 of this analysis we will look at the changing responsibilities at Board level, and some of the threats relating to connected consumer devices.